The Chinese Crested Powderpuff maybe one of those best-kept secrets of the dog world—gentle, happy, loving and totally devoted to his owner. Many people label their small breed dog a Velcro dog because they tend to follow you everywhere, and no dog deserves this description more than the Chinese Crested. Many people know the breed through their notoriety in the annual Ugliest Dog Contest. However, that does not begin to do the breed justice. Sometimes affectionately called the Dr. Seuss dog because the hairless variety can resemble some of the unusual characters imagined by the famous children’s author and illustrator. There are two varieties of this breed, the hairless and powderpuff. They are both members of the same breed although they look vastly different. 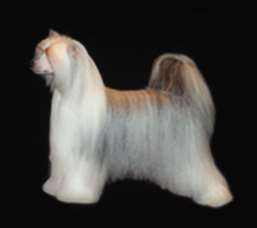 Genetically there is no difference, and both hairless and powderpuff varieties occur in the same litter. Slight boned and delicate, these dogs have often been described as cat-like. They “perch” on the back of a sofa, on your lap, or share your pillow at night. If cold, they are just as likely to borrow under the covers with you. On both varieties, their ears can be up or down. Show dogs must have erect ears and breeders or owners may tape the ears if they do not stand up on their own. Pet owners can decide whether they want the ears up or down. Both varieties do not do well in the cold. The hairless, in particular, will need coats in the winter, but even the powderpuff will appreciate a warm sweater or coat in severe weather. They seem to do better in the heat, but either way, they must always be considered inside dogs. Never leave a crested outdoors. 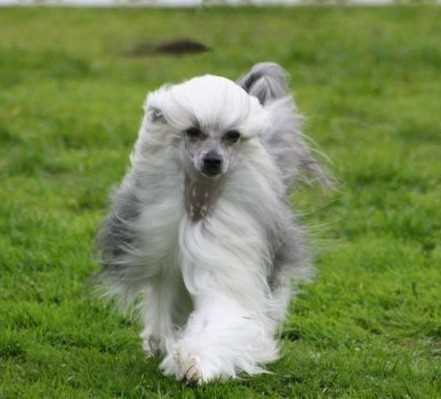 Chinese Crested Powderpuffs are people dogs and do not do well if separated for long periods of time. If left alone, they can suffer from separation anxiety and become barkers or destructive. Their sensitive nature sometimes makes them difficult to train unless you are patient and very gentle in your methods. Like many small breed dogs, housebreaking usually takes longer, and many will relapse from time to time. 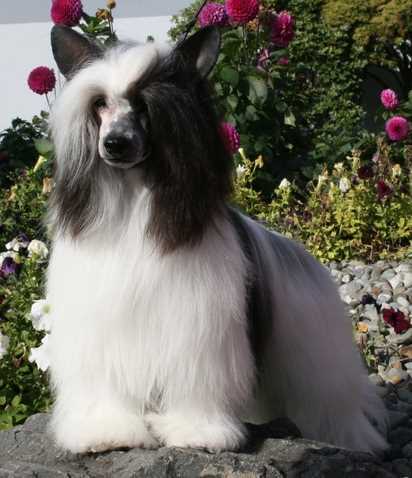 The Chinese Crested powderpuff variety has a silky, thick double coat that consists of a straight silky outer coat and a short wooly undercoat. Beyond the outward appearance, there is little else to distinguish the two varieties of the Chinese Crested. No early written historical records exist concerning the origins of this breed, so theories and speculation have filled in the gaps. One theory suggests that the Chinese Crested can trace their ancestors back to the African hairless dogs. These small dogs were traded by merchants and sailors that traveled from port to port, making their way to China. The Chinese loved small dogs and bred these hairless dogs to other dogs reducing the size and creating a new breed. There is evidence that by the 1500s, Chinese traders purchased these dogs from either Mexico or Africa and then sold them to other ports around the globe. By the 1800s, the Chinese Crested appeared in ports in Central and South America as well as Asia. It is thought that these dogs were regular passengers on old sailing ships, helping to catch vermin and may have been around to help control rodents responsible for carrying the plague. The Chinese Crested, hairless variety was used as a type of hot water bottle for those sailors suffering from ailments requiring warmth. Lastly, when food stores ran low, these dogs served as meals for the sailors thereby earning them the title, Edible Dog. 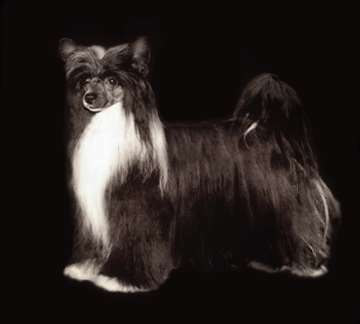 When dog shows became fashionable in the late 1800s, an occasional Chinese Crested was among the dogs exhibited. Throughout the first half of the 20th century, these dogs were being shown by enthusiasts especially ladies prominent in the entertainment industry. The breed was accepted into the Miscellaneous Class of the American Kennel Club in 1955 but not fully accepted as a breed until 1991. Look at a picture of a Chinese Crested Powderpuff, and you might think he is smiling at you. Whether they actually smile or just show off their lovely face, this breed showers his owner in love and devotion. If you are the proud owner, you will have a loyal companion, but remember they are rather sensitive, so only a gentle touch will be acceptable by these dogs. The Powderpuff is a highly social dog and does not do well if you leave him alone for long periods of time. They can often be “needy” of your attention but shy around strangers. They do great with courteous, respectful children and get along fine with other pets. Although they may be the ultimate cuddle bug, they are active, entertaining, and playful. These dogs are a little timid around strangers, so puppy socialization is most important. An occasional walk will do him fine, but they can get all the exercise they need indoors by playing and following his owner from room to room. They do well in agility, obedience, lure coursing and conformation. They also enjoy a lively game of fetch now and again. Their quiet nature and their slight energy needs make them an ideal companion for a city or apartment dweller. But, because they are so flexible, they also do equally well in the country or rural areas as in the city. Both varieties require grooming, but the Chinese Crested powderpuff needs more. Their double coat continues to grow to be quite long. There is little shedding, so that you will not find hairs around your home, but this means that the coat can mat easily. These dogs need daily brushing. Before brushing, mist the hair with a spray on conditioner. This will prevent hair breakage and reduce the static electricity that often occurs in dry climates. Since shedding is minimal, these dogs are considered hypoallergenic and might be perfect for allergy sufferers. Non-show puffs are often clipped into a “Pony” cut that leaves long hair on the bottom of the legs, tail, and head, commonly called the crest. Nails should be kept short, but the “quick” or blood vessels running through the nails are longer on the Crested than other breeds. Long quicks result because they have a different shape of the foot often called a “hare foot.” Hare foot, as the name implies resembles the foot of a rabbit—longer and thinner than the average dog foot. A weekly bath is often recommended to keep them looking and smelling fresh. 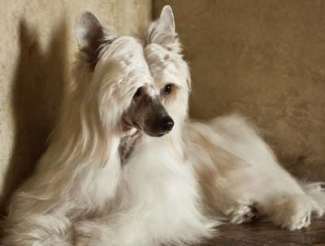 The Chinese Crested powderpuff variety does not seem to share the same skin problems as the hairless, so no need for sun block and acne is usually not an issue. They need their ears checked periodically and wiped clean with a cotton ball. If there is any redness or odor, it is time to call the veterinarian. Red, odorous ears are associated with infections. Teeth should be brushed ideally daily but weekly is highly recommended. 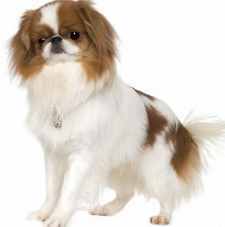 They are a healthy breed but like many other small breed dogs, they can be affected by genetic diseases. Eye problems are among the most common complaint of Puff owners. Two forms of Primary Lens Luxation have been identified in the breed, as well as glaucoma and Progressive Retinal Atrophy (PRA). There are genetic tests currently available for one form of PRA and Primary Lens Luxation. The tests will only determine if the sire or dam is a carrier, is clear or is affected. It is not fool foolproof, but responsible breeders will have their crested dogs’ eyes check routinely. Another eye problem that can occur is called Keratoconjunctivitis sicca or dry eye syndrome. They are also prone to several skeletal problems such as Luxating patella and Legg-Perthes Disease, two very common conditions in small breed dogs. A famous blind Chinese Crested Dog, Sam was the winner of the World’s Ugliest Dog Contest from 2003 through 2005; Chinese Crested dogs have also won this contest in 2007, 2008, 2011, and 2012. If you are serious thinking about adding a Chinese Crested to your household, you will want to know as much about the breed as you can. Here are some great reads that will help you on your path to dog ownership. If you found this article helpful, you might want to check out these similar breeds.